President Donald Trump speaks during a meeting on women in healthcare, March 22, 2017, in the Roosevelt Room of the White House in Washington. Two months into his U.S. presidency, Donald Trump continues to draw criticism for holding onto political claims that have been rejected by Washington officials, pundits and fact checkers. In a new interview with Time magazine released Thursday, Trump refused to back off a string of unfounded allegations, including that former President Barack Obama wiretapped his Trump Tower headquarters in New York in the weeks before last November's election, that 3 million undocumented immigrants voted in the election, and that Muslims in New Jersey celebrated the 2001 terrorist attacks on New York. Trump has not substantiated any of the three claims. "I'm a very instinctual person, but my instinct turns out to be right," Trump said. "When everyone said I wasn't going to win the election, I said, well, I think I would." The country's 45th president said of the wiretapping claim, "We will see what happens. Look. I predicted a lot of things that took a little bit of time." Trump spoke to the magazine as news was breaking Wednesday in Washington that Devin Nunes, the Republican chairman of the House of Representatives Intelligence Committee, said Trump transition officials and possibly Trump himself were captured in a legal, "incidental collection" of wiretapped conversations as Trump transitioned to power after the November 8 election leading up to his inauguration on January 20. But Nunes, Federal Bureau of Investigation director James Comey and several national security officials have all said Obama did not wiretap Trump. Trump said of Nunes's new wiretap disclosures, "Who knows what it is? Well, he just got this information. This was new information. That was just got. Members, of, let's see, were under surveillance during the Obama Administration following November's election. Wow. This just came out. So, ah, just came out." 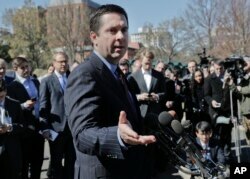 House Intelligence Committee Chairman Rep. Devin Nunes, R-Calif, speaks with reporters outside the White House in Washington, March 22, 2017, following a meeting with President Donald Trump. As for the 3 million illegal voters, Trump said, "I think I wilI be proved right about that, too. I have people that say it was more than that. We are forming a committee. And we are going to do a study on it, a very serious problem." He also cited a 2001 Washington Post story that briefly mentioned an unverified claim that Muslims celebrated on the day of the terrorist attacks, September 11, 2001, but police in New Jersey said the celebrations did not occur, even as Trump claimed, erroneously, during his run to the White House that he saw it on television. Aside from his election, Trump said he has correctly predicted, among other things, Britain's exit from the European Union, disturbances among immigrants in Sweden, and that emails from his Democratic challenger, former U.S. Secretary of State Hillary Clinton, would turn up on the computers used by a disgraced congressman, the husband of a key Clinton aide. 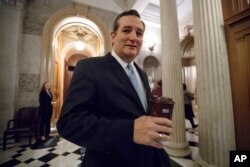 FILE - In this Feb. 3, 2017 file photo, Sen. Ted Cruz, R-Texas, departs the Senate chamber on Capitol Hill in Washington. In other instances, Trump said he was merely passing on dubious claims made in publications he reads or listens to, such as a contention that the father of Senator Ted Cruz, Trump's key challenger for the Republican presidential nomination last year, was a cohort of Lee Harvey Oswald, the man who carried out the 1963 assassination of President John F. Kennedy. "Why do you say I have to apologize? Trump asked. "I'm just quoting the newspaper." Asked whether it worried him that his credibility would be hurt with false claims, Trump responded, "Name what's wrong! I mean honestly." "What am I going to tell you?" Trump concluded. "I tend to be right. I'm an instinctual person, I happen to be a person that knows how life works."